Okay, I admit I totally missed out the months of June and July as I simply I ran out of time to write a blog post and it seems ridiculous to write about June when we are now heading towards the end of September. So I’ve simply skipped it, sorry. Instead, I’m focusing on some of the great books I read these past two months and as always, I’ll be offering you the chance to read one of them too as part of my ‘pay it forward’ project. You can read more about that here if you are interested. Last time Vicky from @firepitsandfairylights was the lucky recipient of my copy of Celeste Ng’s ‘Little Fires Everywhere’. If you’d like to receive any one of these titles below, then please leave me a comment below with a contact email, Instagram account info or you can DM directly on Instagram @jenlittlebirdie so I can get in touch to arrange postage. UK only, sorry and I’ll be randomly selecting a recipient at the beginning of October. 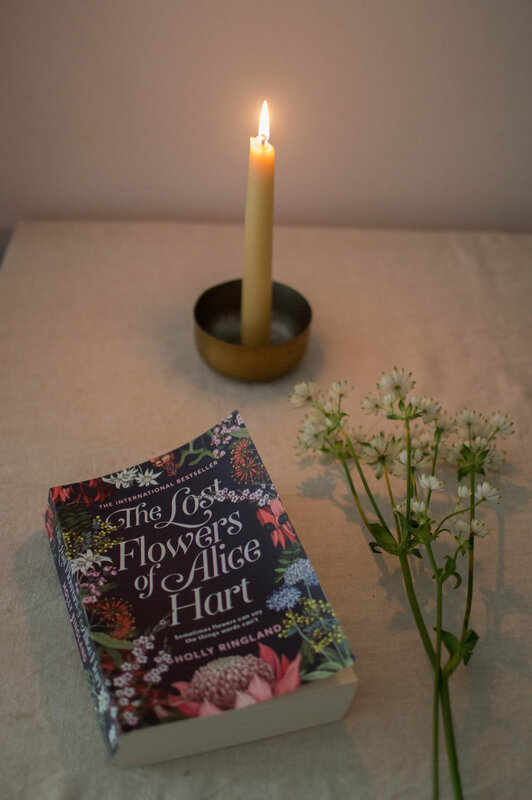 ‘The Lost Flowers of Alice Hart’ by Holly Ringland - probably one of my favourite reads this year. Set in Australia, this is a glorious tale of young Alice who is left orphaned and sent to live with the Grandmother she has never even heard of. Alice finds herself growing up on a flower farm with a group of women who have all been through difficult periods and situations in their lives. Together, they are helping one another to heal through the power of nature. Alice’s Grandmother has kept some secrets buried and it is only when Alice starts to ask questions about her family that she realises she must find the courage and uncover the truth. It’s a beautiful book, utterly charming and will make you long to visit Australia and gaze at the wildflowers. ‘Into the Water’ by Paula Hawkins - a strange tale of a community that have to deal with several suicides. Jules returns to her hometown to help take care of her teenage niece after hearing that her sister Nel has died.The townsfolk believe that Nel committed suicide, like many other women who have also chosen to throw themselves off a cliff and into the river below. Yet, her sister isn’t convinced and believes there is something more sinister at play. It’s a town with secrets and everyone seems to have something to hide. ‘The Enchanted Life - unlocking the magic of everyday’ by Sharon Blackie - essentially this is a book that calls women to re-engage with the world through nature. It is about learning to re-ignite our creative imagination and embrace wonder. It looks at how we can work with heart and meaning as well as being rooted in our place and community. Pitched to help those who are looking for a more ‘authentic, harmonious and connected lifestyle’, it’s not an easy read and at times I found it a struggle. But, it had plenty of interesting nuggets and it’s made me look very differently at crows. ‘The Salt Path’ - Raynor Winn - truthfully I haven’t started this yet but it’s next on the list so I thought I would include it here. This is the true story of Raynor and her husband Moth. Just days after discovering that Moth is terminally ill, they lose their home and their livelihood. With very little time left, they embark upon a walk of 630 miles, carrying only the essentials they need to survive the journey. The blurb describes the book as ‘honest and life-affirming’ and ‘ultimately, it is a portrayal of home, and how it can be lost, rebuilt and rediscovered in the most unexpected ways’. I’ve had several people recommend this book to me and I’m looking forward to getting stuck into it this weekend. ‘Slow’ by Brooke McAlary - if you are a regular reader of this blog you’ll know that I talk about Brooke and Ben’s podcast ‘The Slow Home Podcast’ a lot. I’ve learned a whole lot about slow and simple living over the past few years that I’ve been listening to the poggie and I was super excited at the prospect of Brooke’s book being published in the UK this Summer. I’m pleased to say that it didn’t disappoint. From finding out what your why is, decluttering, unsubscribing from the rat race to how to live a more contented life, this is a book that is a great introduction to those embarking on their slow living journey.